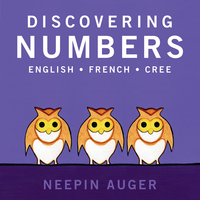 From apple to zigzag and from 1 to 10, Neepin Auger’s books for children will be certain to educate and entertain preschoolers, parents and teachers alike. Inspired by her training as a First Nations artist and her academic work leading to a degree in education, Discovering Words and Discovering Numbers contain brightly coloured, originally created artwork featuring images and concepts familiar to everyone. 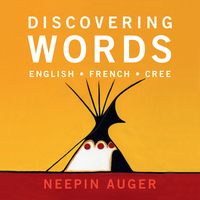 In addition to the English words presented, the books also contain the French and Cree equivalents, placing these among some of the most dynamic and useful board books on the market, perfectly suitable for the classroom, library and nursery. Neepin Auger is a Cree artist, educator and mother. Originally from the Bigstone Cree Nation in northern Alberta, she has been painting for over ten years, having studied art under her father, Dale Auger, a renowned First Nations artist and author of the award-winning children’s book Mwakwa -- Talks to the Loon: A Cree Story for Children (Heritage House, 2006). She is currently studying in the Department of Education and Schooling at Mount Royal University and is the mother of one daughter, Gracie, whom she believes is her greatest masterpiece. Discovering Words and Discovering Numbers are her first books. She lives in Calgary, Alberta.